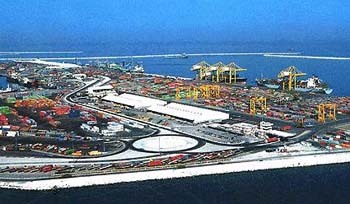 DUBAI (WAM) — Dubai Ports International (DPI) is investing Dh1.146 billion (US$312.5 million) in the development of nine container berths in Busan's new port in South Korea, said Mohammad Sharaf, managing director of Dubai International, the overseas port and free zone management arm of Port Customs and Free Zone Corp.
As part of our acquisition of the CSX World Terminals (CSXWT) assets, we have gained 25 percent of the management of Busan's new port, he said. This involves nine berths in the container terminal. As part of the acquisition, we are investing 25 percent of the total development, valued at US$1.25 billion. DPI recently completed the acquisition of nine terminals involving 24 berths with a combined capacity of 14.6 million TEUs from CSXWT for Dh4.22 billion (US$1.15 billion). This is in addition to its Dh3.38 billion (US$930 million) investment in Kochi. Busan is the fifth largest seaport in the world after Hong Kong, Singapore, Shanghai and Shenzhen, having handled 11.4 million 20-foot-equivalent units (TEUs) last year. Sharaf said construction of the nine berths is progressing well. In the meantime, a trade delegation from the Busan-Jinhae Free Economic Zone Authority (Bjfeza) is in Dubai to promote trade and investment between the two emerging economies. Soo-Man Chang, Bjfeza commissioner, said: "We find strong synergies between Dubai and Busan. We are in talks with UAE investors to expand their bases in Korea to reach a larger consumer base. We are offering good investment opportunities in real estate, tourism and other economic areas with high returns." Busan will also sign a memorandum of understanding with Dubai authorities to promote trade and investment, said a senior Korean government official. Bjfeza is also looking to open a marketing and representative office in Dubai to attract investment from the Middle East.